As a little Catholic girl, I decided to become a saint. 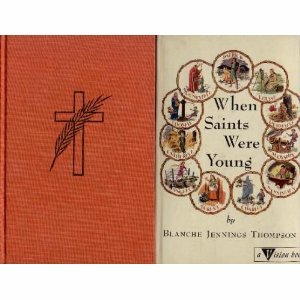 One of my favorite books was When Saints Were Young. My favorite story from the book was that of St. Germaine. As a child she was mistreated by her stepmother and made to work outdoors as a shepherdess. Though dirt-poor, she was very devout, attending daily Mass (leaving her flock in a wolf-infested area—and they were never harmed), and praying on a rosary she'd made out of string. How I longed to be holy like Germaine!! Minus the poverty and sheep-herding parts of course!! In second grade I determined that sainthood was within my grasp, and thus began a rigorous program to become one of the blessed ones. Every night I played a record of Gregorian chants as I prayed and prayed, and waited for a vision (saints seemed to have visions). I also hoped for the stigmata (wounds resembling those of Christ on the cross). That would be living proof that I was pretty darned special! Mind you, I still disobeyed my parents and fought with my sisters to beat the band. But saints were once sinners too, right? As long as I prayed myself into a trance nightly, aided by that other-worldly music, all would be forgiven. Alas, my campaign for sanctity failed miserably. No visions, no flesh wounds, and the Gregorian chant record started to skip. I seemed incapable of curing anybody of disfiguring sores or even the common cold. It was with regret that I abandoned my quest and moved on to being an aspiring jet-setting ace reporter with a Barbie-style dream car. When I became a Lutheran in my early thirties, I left the Catholic Church, with a tinge of sadness that there was a plethora of saints I felt I could no longer pray to. We Lutherans tend to believe that we can eliminate the middle man—or woman—and talk with the Big Boss directly. Oh, I still invoked St. Anthony to locate my lost items. But no more St. Christopher (safe travels), or St. Blaise (throat diseases) or St. Dymphna (mental health—and I could’ve really used her help there). Last Sunday was All Saints Sunday in church. As names were read of people who died in the past year, a bell tolled. We recognized that, flawed and falling-short as they may have been, they stand as saints in God’s presence now. No need for a team of Vatican lawyers to validate. No toting up of beatific visions and miraculous acts necessary. Our dear ones, just by virtue of being loved by our God, are saints. Because, in the end, it isn’t about what we do, because the best of us could never do enough. It’s about what God does through us, each one of us, poor shepherdess and struggling spiritual formation director alike. Through God’s grace our lives can become holy things, and in loving God we can become holy too. 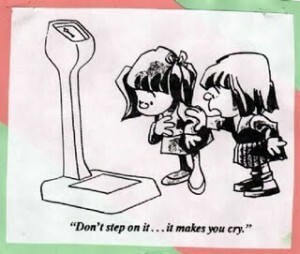 Embarrassing as it is to admit, I am addicted to the bathroom scale. I’ve never been overweight, really (though I always think I am), so perhaps it is unnecessary for me to daily obsess about the magic number (118 = happy! 123 = miserable!) 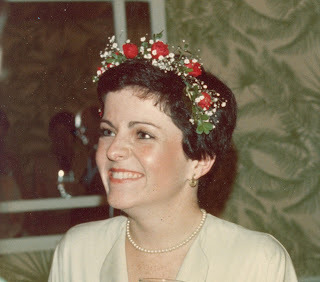 I cannot tell you one single conversation that transpired at my wedding reception, but my wedding morning weight (110!) I will never forget. As a young teenager, I went through a stretch of consuming just two cups of chicken broth and one pint of ice cream daily. I dwindled away to practically nothing. I used to run out of school at dismissal time because the sound of the final bell echoing down the corridors triggered a sick-making hunger headache. When I was sad or worried, I stopped eating. When I was ecstatic/in love…I stopped eating. I don’t think one of my dates ever actually saw me consume a bite of food, ever. As my parents Joanie and Tom dwelled in La La Land, no one ever thought to put the brakes on my self-destructive behavior. And so I proceeded into married life, nibbling when I’d have loved to gobble. During my pregnancies, I dutifully consumed my fish and veggies and milk, and packed on the suggested pounds. As soon as the babes were delivered I cut myself off from viands until I was once again in optimum weight range. Menopause has been a challenge, as my never-robust metabolism has slowed to a crawl. But wait! I got a lucky break! I was diagnosed as bipolar (it’s lucky! Stick with me!) and was prescribed Wellbutrin. Within days, the scale numbers started to plummet. 112! 107! Numbers I hadn’t seen in 30 years appeared on the dial. For the first time in memory, I was buying size zero clothing items (Think about it. What is size zero? Are you invisible?) Alas, at a certain point my wonder drug betrayed me, and the weight loss ceased, which was probably good because at the rate I was going I would have ended up a stylish skeleton. Nowadays, I am trying hard not to be a prisoner of the scale. I am making my peace with my 55 year old body, after a long and hard-fought war. It is such a woman thing, this self-flagellation with a Ramen noodle. Guys walk around with a paunch like a kangaroo with twins and think they’re A-OK. But we women kill ourselves to be super-svelte, to be size zeroes instead of perfectly acceptable size 12s. 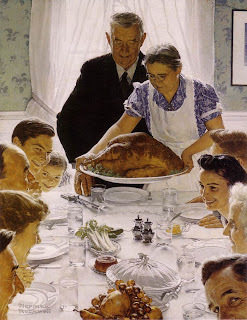 Tonight, as I eagerly anticipate (and am humbly thankful for) a delicious meal cooked by my lovely daughter-in-law, I encourage us all: stop the madness! Eat something, for heaven’s sake! It is obscene to starve ourselves in a world where so many are starving, period. Let’s be grateful. Let’s stay balanced. Tomorrow I will not weigh myself. I will weigh instead my kindness, my compassion, my humanity. I will calculate the numbers that truly matter, and try to let the rest go.